Ackermann’s Repository of Arts, December 1812. This is one of the few times I have seen pockets mentioned in a fashion print description. The other mentions are almost always with a riding habit. 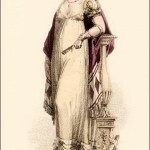 It is certainly unusual to see pockets shown with an evening dress. 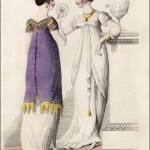 Though large pockets tied around the waist under a dress were worn throughout the 18th century, the narrow silhouette of the Regency era did not allow for bulky pockets underneath. 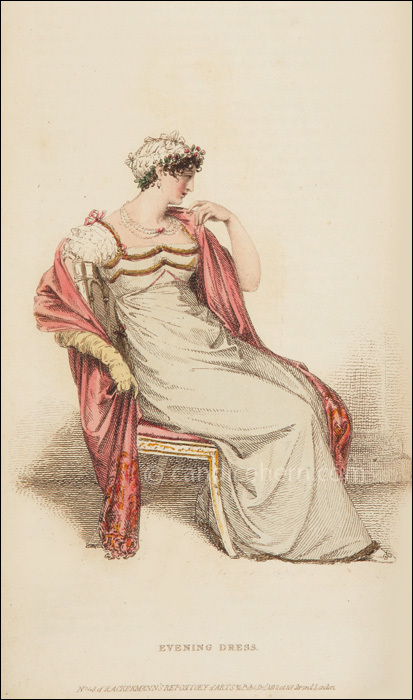 However, I have seen several extant examples of early Regency dresses with slits for pockets, so they must have been worn sometimes, but likely smaller and flatter than 18th century pockets.